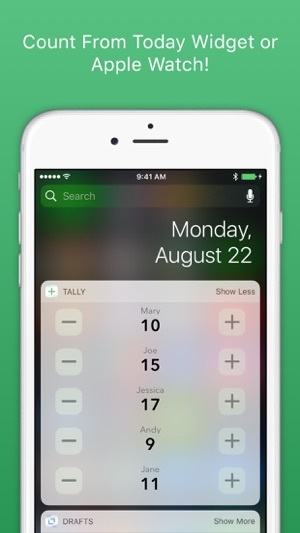 Tally is the easy and quick way to keep count on your iPhone, iPad and Apple Watch. Easy gesture interface keeps your eyes free while counting. - Easy gesture support. 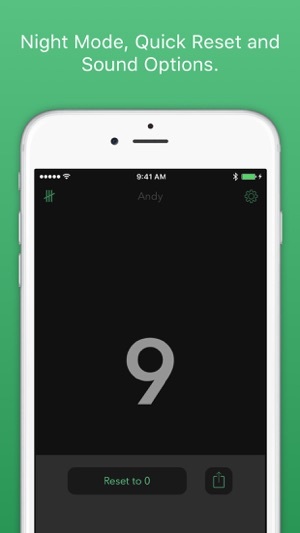 Tap to count, swipe down to count in down. - Today widget with counting capabilities to easily access and update multipe tallies. 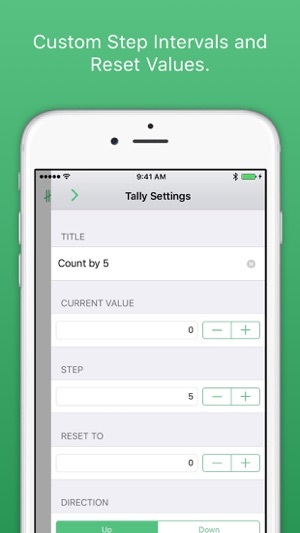 - Create multiple tally counters for tracking multiple totals. Swipe to right to show tally list. You can even count in the list, great for game scoring! - Each tally can count up or down, and have a "step" increment – to count by twos, fives, tens, whatever. 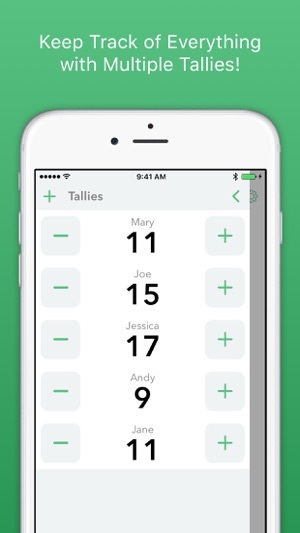 Swipe left to configure a tally. 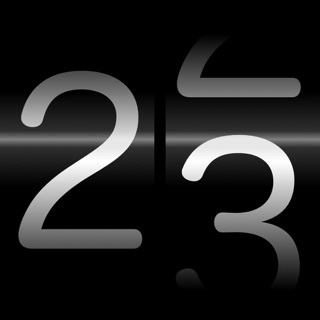 - Visual and audio confirmation of counts. - Quick reset to a starting value. - Share integration to export current tally value, or all tally values. - Haptic feedback on supported devices. - Dark theme for low light counting. - Support for the latest devices and screen sizes. A must-have app and some customization would be nice. 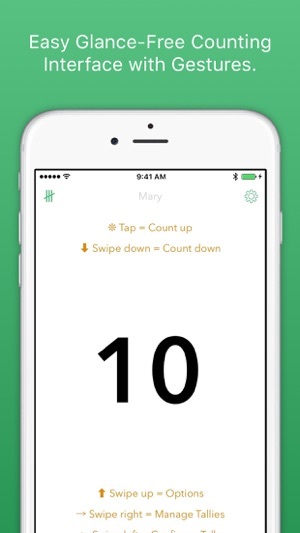 This app is great on its own as a counting app for a single event. The operation order is simple and nothing additional adds confusion. It would be nice to have a multi-portion option for counting different events without having to switch. I use this app as a counter for multiple events that occur in order (when it is a positive result) and that extra bit of time/management of what counter I'm counting on can be muddled up on occasion simply because I haven't selected it. I end up with a count that is estimated/rounded due to my human error. A multi-counter screen would help me count on the right or left for multiple counters without delay or error. In any other case, great job guys, this app fits right in there for must-have apps. This is my go to counter for professional tracking of productivity. Simple, fast, accurate and exactly what it needs to be. However, with the latest update it lost the ability to be utilized on the Apple Watch making it significantly less functional. It’s clearly a five-star app but with this drop in its functionality I’m forced to drop its rating. Hopefully Watch support will return soon as it is one of the main ways it fits into my workflow, otherwise another app will have to be found. Such a good app that I’m still sticking around to see, but that goodwill only goes so far when the loss of functionality impairs it’s usefulness so much. I like it! Wish it had a way to connect two tallies in such a way that when tally went up a connected tally would go down by the same number. We count the number of boats entering our park, which reduces the the number of boat parking spaces we have available. Different employees need to know these two different tallies. Please add this feature. © 2012-2018 by Agile Tortoise, Inc.